Jim Lewis, pioneer astrocartographer, offers an excellent description of what to expect under the influence of your major astro-locality planetary lines -those falling under the Ascendant, MC, Descendant, and IC. 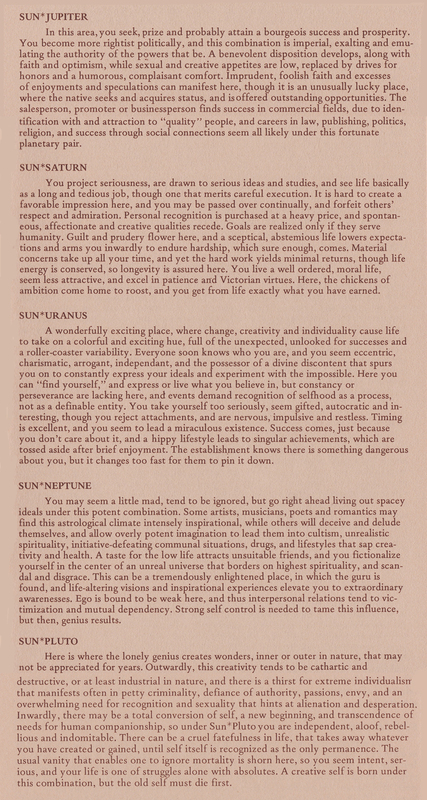 In his booklet, Astro-Carto-Graphy(1976), he gives a brief but concise introduction on the subject, followed by a planet by planet description on each of the four cardinal angles of the locality birthchart. He then goes into an equally informative planet to planet description of planetary crossings or parans(the latitude at which two or more planet lines intersect). 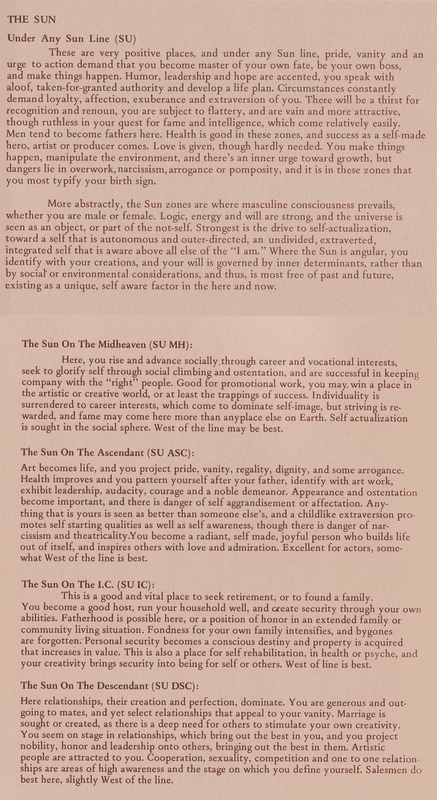 Below is a sample description of the Sun and its influence under any Ascendant, MC, Descendant or IC line. Below are descriptions of Sun or latitude crossings with the other planets. For complete descriptions and services visit the home of Astro-Carto-Graphy. 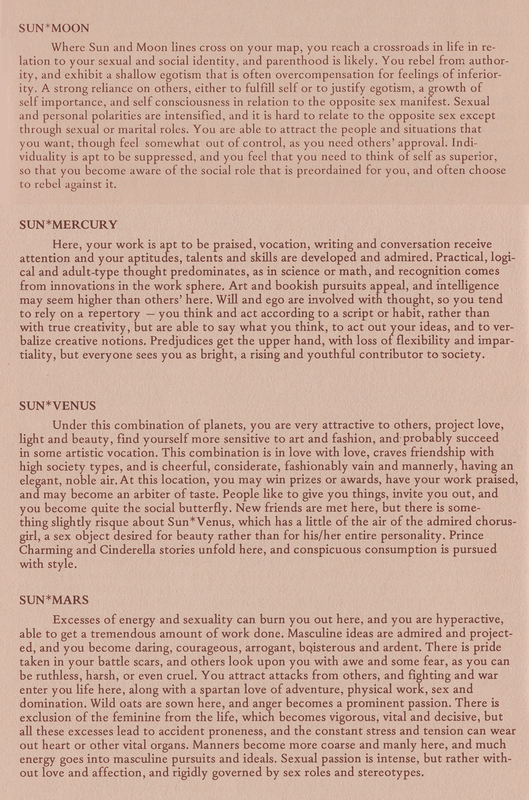 "If you decide to use your astrology software for locational work, i.e. to ascertain the planetary influences on a person at particular locations, you will be faced with the decision about whether to use the methods pioneered by Jim Lewis called Astro*Carto*Graphy, or instead a method that relies upon Zodiacal Longitude (i.e. oriented toward the coordinates of a birth chart). When Jim Lewis pioneered astro-locality work by introducing Astro*Carto*Graphy, he constructed maps showing mundane (aka "In Mundo") rising, setting, culminating, and anti-culminating lines, i.e. lines illustrating where (at the chosen time) a person would actually witness, for example, the Sun or any other planet rising over the Horizon. He, and many other astrologers, explored, researched, and refined their understanding of this method, which has proved very accurate in describing the effects of location upon a person. Many years after Astro*Carto*Graphy was developed, some software makers decided to allow astrologers to create maps using Zodiacal, as opposed to Mundane, map lines. These lines do not show when a planet will rise or culminate visibly, but instead when they will cross the Ascendant or M.C. of a person's chart. As such, this is a complete departure from Jim Lewis' Astro*Carto*Graphy. Zodiacal mapping is the default mapping method in the programs Kepler and Sirius, and to see Astro*Carto*Graphy maps in these programs, you must change the settings. While these Zodiacal maps reflect birth charts, all of the research and conclusions of Jim Lewis' work may or may not apply (since he was using different calculations). You cannot use standard aspect lines, however, unless you use Zodiacal mapping. That's because aspects do not translate easily into Astro*Carto*Graphy's mundane frame of reference. Aspects, after all, are measured along the ecliptic, in a single dimension of Zodiacal longitude, while the planetary lines of Astro*Carto*Graphy are mapped out through the use of two entirely different coordinates (Right Ascension and Declination) related to the celestial equator. Mr. Irving goes on to point out that two cities within one degree of longitude can be over three thousand miles apart, illustrating the uselessness of applying one-dimensional "ecliptic thinking" to astromapping. Astrology programs that do portray aspect lines with Astro*Carto*Graphy don't agree with each other on how to do so. In fact, it is unclear how such lines should be calculated, since this is a departure from Jim Lewis' work and there is no obvious mathematical way to construct aspect lines. Therefore, astrologers should either choose Jim Lewis' Astro*Carto*Graphy's principles and use In Mundo/Mundane coordinates, or switch to the Longitude/Zodiacal method and understand that while there is little research supporting this approach and a couple of different methods of calculation, they can use aspect lines in their astro-mapping. Note: Whether the Tropical or Sidereal Zodiac is used in astromapping, the maps remain the same because it doesn't matter what the sign is, just whether a planet is aspecting the Ascendant or M.C. for a line to be drawn."